My name is Lyman Stone, and I’m an economist at the Tax Foundation. For those unfamiliar with us, we are a non-partisan, non-profit research organization that has monitored fiscal policy at all levels of government since 1937. We have produced the Facts & Figures handbook since 1941, we calculate Tax Freedom Day each year, we produce the State Business Tax Climate Index, and we have a wealth of other data, rankings, and information at our website, www.TaxFoundation.org. In my testimony today, I will offer a brief description of why inflation indexing is important, and how it should function in an ideal tax code. Since the federal government’s adoption of it in 1986, inflation indexing has become increasingly standard in state income tax modernizations. 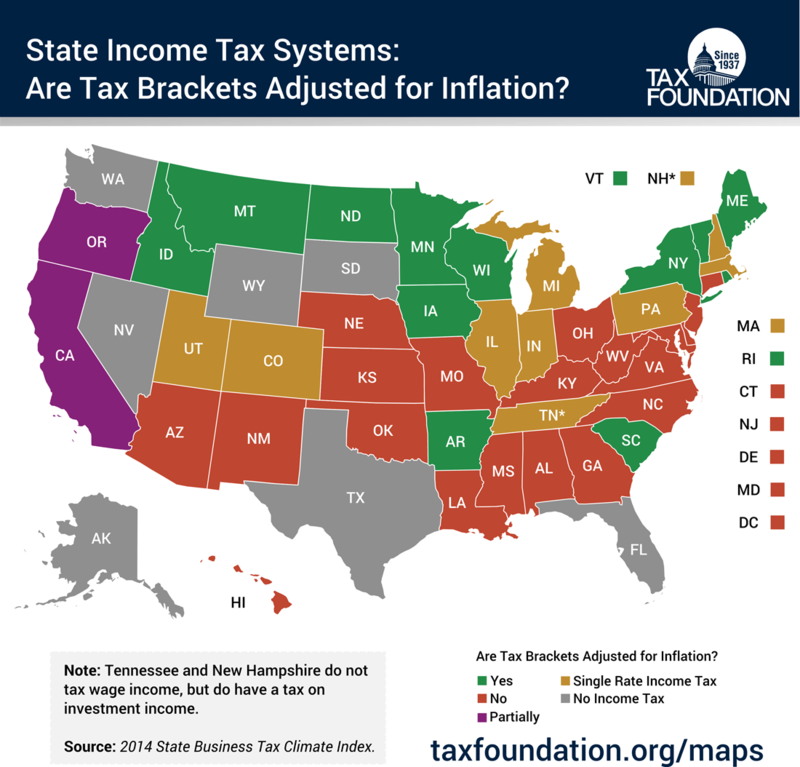 Of the 34 states with bracketed income tax systems, 14 of them wholly or partially index their tax brackets to inflation. It enables state tax codes to remain fair and appropriate without frequent legislative intervention. House Bills 0522, 0528, and 0557 all include reforms which would incorporate significant components of inflation indexing in key components Maryland’s tax code, such as the standard deduction, personal exemptions, and the tax brackets themselves. While we at the Tax Foundation take no position on legislation, I hope to give a review of the topic at hand and contribute our understanding of the related economic literature. In a state that does not index tax provisions to inflation, taxpayers suffer from what is known as “bracket creep.” This phenomenon causes wage inflation to push nominal wages, or a worker’s wages “on paper,” up even as taxpayers’ purchasing power remains the same. With higher nominal wages, they are pushed into higher tax brackets and owe more taxes. Paying higher taxes on income that is worth the same amount is especially damaging for low-income taxpayers, who are the most likely to suffer from significant bracket creep due to Maryland’s numerous clustered tax brackets on lower income levels. Furthermore, a lack of inflation indexing creates uncertainty about taxpayers’ future real income. Taxpayers not only have uncertainty about the dollar amount of future income and future inflation, but they have uncertainty about future real taxes. This uncertainty about the real value of future tax payments violates a key principle of sound tax policy, namely that tax policy should be transparent and stable and not prone to unpredictable swings. Inflation indexing stabilizes expectations about the real value of future taxes by ensuring taxpayers that their inflation-adjusted tax burden, the real cost of taxes, will remain roughly stable unless the legislature actively changes the tax code through the normal public process. Without inflation indexing, tax burdens rise faster than wages: but also faster than a business’ inflation-adjusted revenue. Employees will seek to preserve their after-tax income and demand raises at a rate faster than inflation, but employers can only offer raises at the pace of inflation. Thus, lack of bracket indexing makes it hard for businesses to hang on to the high-skilled workers who drive modern economic growth. Inflation indexing operates by chaining the threshold for every tax provision to an appropriate measure of inflation, making necessary adjustments in January of each year. For example, tax brackets and standard deductions should be tied to a measure of wage inflation. Wage indices are generally preferable to price indices in order to ensure that taxpayers’ effective tax rates don’t fluctuate, and to stabilize the share of state income going to the government. Moreover, inflation measurements ought to correlate to jurisdictional lines: Maryland’s inflation indexing should be based on inflation in Maryland, not inflation throughout the nation. For convenience, most indexing states use various provisions of the federal Internal Revenue Code similar to federal inflation indexing, but this can result in tax brackets changing at a faster or slower rate than is appropriate for a specific state. Among inflation indexing states, only California indexes based on a state-level factor. Whatever index value is used, it is vital that it be employed consistently. For example, if inflation has been 2 percent, then all brackets should be increased by two percent: not some by 2 percent and others by some other rate, either lower or higher. Crucially, “same dollar” indexing strategies fail this test. Indexing a $1,000, $10,000, and $100,000 bracket by $50 each is a radically different percent change for each bracket, and leads to different taxpayers having very different experiences in changing tax burdens. If inflation indexing is carried out inconsistently then the full benefits of indexing will not be realized. Allowing some brackets to adjust at rates faster or slower than inflation preserves the unfairness and instability of an un-indexed system for taxpayers in those brackets. Inflation indexing adjusts a state’s income tax code and reduces the need for regular legislative fine-tuning. Its main benefits manifest over many years, or even decades. For this reason, it is vital that inflation indexing be carried out year after year, without interruptions or suspensions, which undermine the stability of expectations regarding future real tax payments, and vitiate the beneficial effects of keeping taxes proportionate to taxpayers’ ability to pay. Inflation indexing is a key reform vital to any tax modernization effort. It enables taxpayers to have greater confidence about future tax liabilities, and prevents un-transparent tax hikes on people whose incomes haven’t increased in real terms. Inflation indexing is especially important in states with many tax brackets on low-income taxpayers, who bear an especially heavy burden from “bracket creep.” With the consistent application of inflation indexing, policymakers can position their individual income tax code to be more neutral, stable, and transparent for all taxpayers.